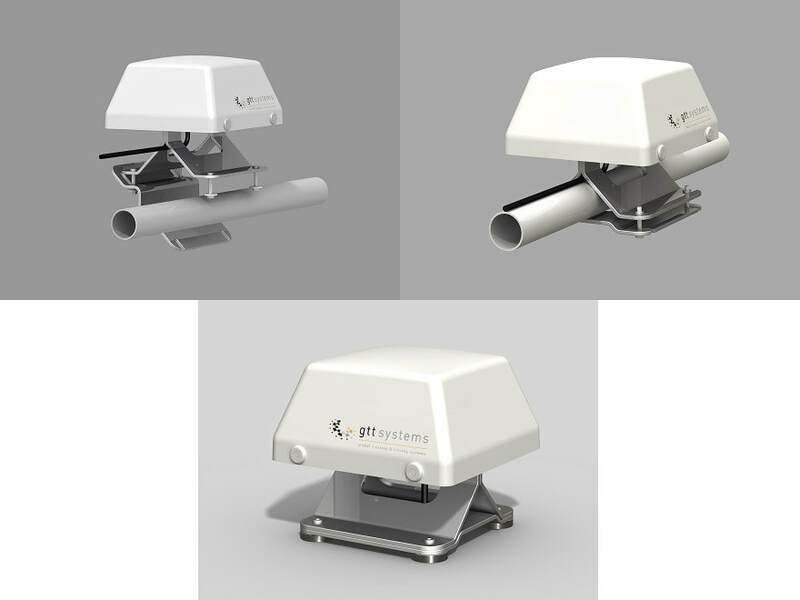 GTTS-3000 series: Iridium Short Burst Data communication terminal. Robustness, Reliability, Long Lasting and a Low Cost price were the keywords during the design of the GTTS-3000. 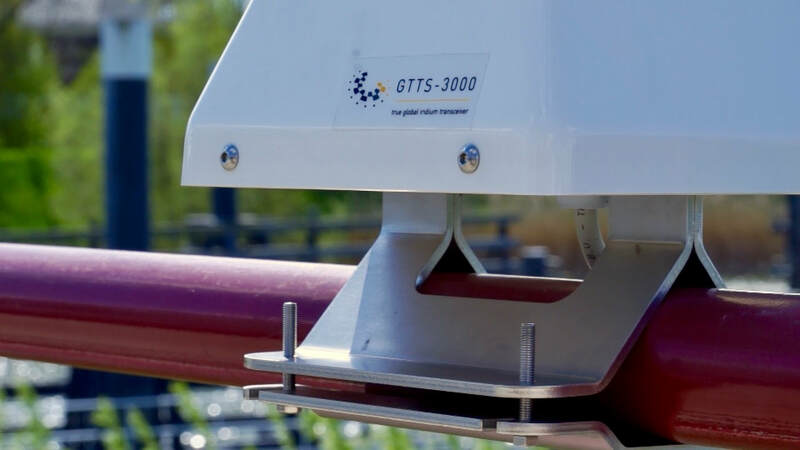 The GTTS-3000 will report its GNSS location with additional speed, altitude, heading etc. 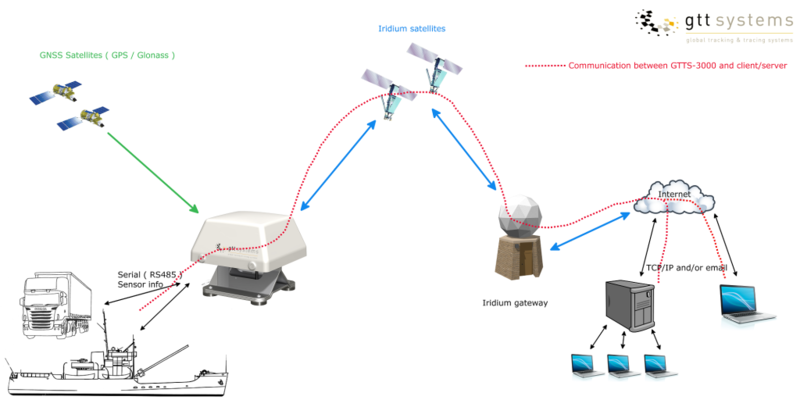 information in configurable time intervals through the Iridium Satellite Network to your own pc/server or to a dedicated geo-server. With mapping software the position and/or trace can be visualized. With the optional GSM/GPRS and battery backup board (the GTTS-3000-Hybrid), larger volumes of data can be sent when close to land (with GPRS coverage ) in order to reduce datacost. AES can be used to secure data. A secondary time interval can be configured to be used when the GTTS-3000 is running from backup battery (optional). To reduce data-costs a geofence can be configured into the GTTS-3000. In addition to position information, the value of the analog input and/or digital input can be send to the server. The digital input can be configured as an panic/alarm input. Through a NMEA style protocol (via the RS485 interface) up to 8 additional analog values can be send to the server. The GNSS information from the GTTS-3000 can also be requested through this RS485 port. 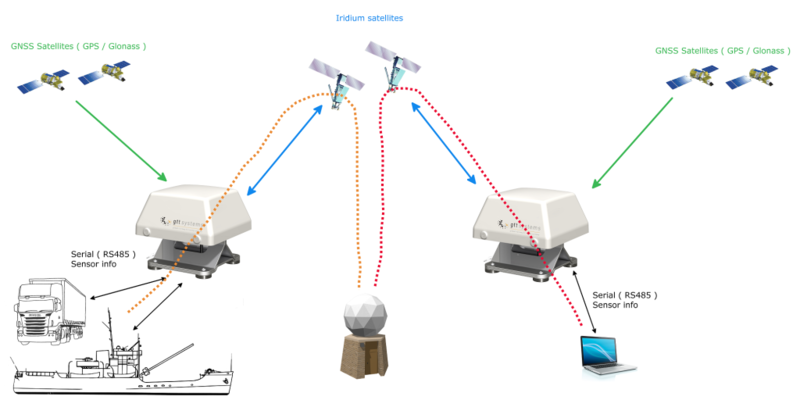 Send data from the GTTS-3000 to another GTTS-3000 directly via the Iridium satellite network.